Rahul Gandhi said RSS chief's speech is "an insult to every Indian"
Kerala CM Pinarayi Vijayan said the comments were in "poor taste"
Congress president Rahul Gandhi and other opposition leaders have accused Rashtriya Swayamsevak Sangh chief Mohan Bhagwat of insulting the Indian Army in a speech he made on Sunday. The RSS said his comments have been "distorted." Mohan Bhagwat had said, "Ours is not a military organisation. But we have discipline like the military. If the country needs it and the Constitution permits... it takes six or seven months to prepare an Army... but swayamsevaks, if asked, can do it in three days... this is what we are capable of." "Shame on you Mr Bhagwat, for disrespecting our martyrs and our Army," Rahul Gandhi tweeted this morning, using the hashtag #ApologiseRSS. He alleged that the RSS chief's speech is "an insult to every Indian, because it disrespects those who have died for our nation. It is an insult to our flag because it insults every soldier who ever saluted it." Kerala Chief Minister Pinarayi Vijayan of the Left said in a Facebook post that Mr Bhagwat's comments were in "poor taste, against Constitutional propriety" and he must apologise. He also said Prime Minister Narendra Modi should "clarify his government's position over Bhagwat belittling Indian Army." The RSS is the ideological mentor of the ruling BJP. 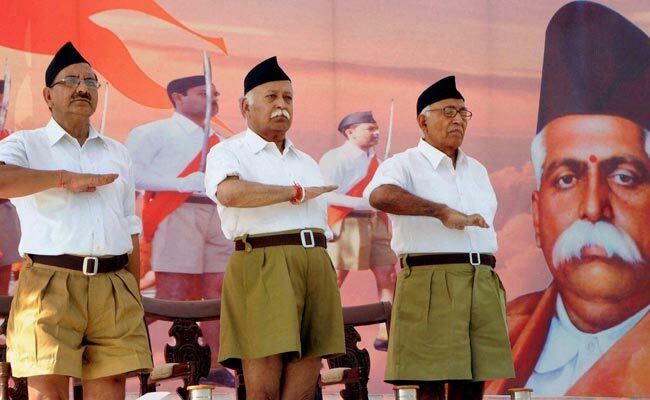 The RSS said Mohan Bhagwat had made no comparisons between the Indian Army and the Sangh's swayamsevaks at all. While critics pointed out that Mr Bhagwat made his comments on Sunday even as the Army was engaged in a massive operation in Jammu and Kashmir to flush out terrorists who sneaked into a military camp and killed five soldiers and a civilian, injuring 11, the RSS said Mr Bhagwat had made no comparisons between the Indian Army and the Sangh's swayamsevaks at all. "People are distorting and presenting Mohan ji's statement. All he has said is if the situation arises, then to stand with the military, it will take six months to prepare an army out of citizens. But because swayamsevaks practice discipline, do parades daily, they can be ready in three days," said the RSS' Manmohan Vaidya. In a statement, Dr Vaidya said it was "a comparison between general society and swayamsevaks. Both are to be trained by the Indian Army only." He attached a video of Mr Bhagwat's speech with the statement. The BJP hit out at Rahul Gandhi for his criticism. "Rahul Gandhi knows nothing about the RSS. He does not know how to respect anyone. Congress leaders are going through a period of frustration," said the party's national spokesperson Vijay Sonkar Shastri.